RALEIGH, N.C. -- Supplemental educational programming for children is just a mouse click away through webcasts created by the N.C. Department of Cultural Resources. Originally broadcast live online, the programs are now available whenever a class or family is ready to tune in. Three of the videos are appropriate for fourth and eighth grade students, while two others are for older students studying textiles. A Colonial Christmas is set at Tryon Palace and explores the history of the holidays with an 18th-century cooking demonstration, a hands-on historic craft to make at you location and interactive discussion exploring colonial holiday traditions. View the Colonial Christmas webcast and teacher guide. Behind the Scene Workings of Civil War Cannons, set at Bentonville Battlefield, will demonstrate and explain the workings of Civil War cannons with firings. 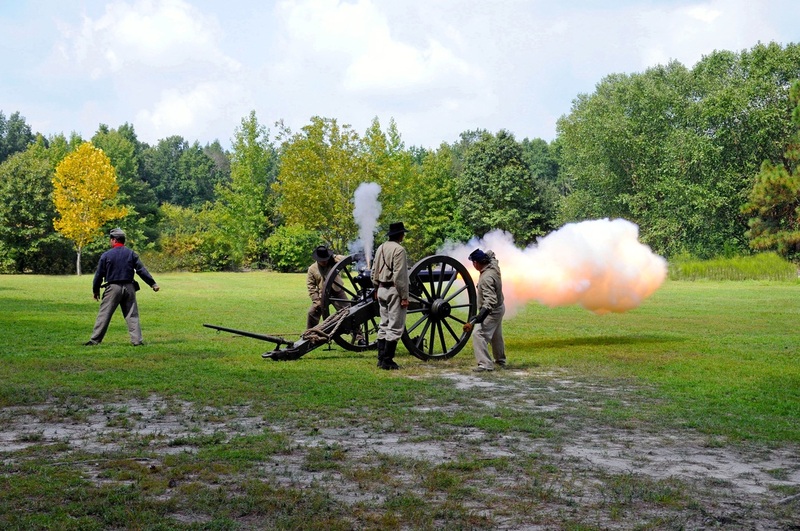 Visit the Civil War Cannons webcast. Queen Anne's Revenge Underwater Archaeology is set at the N.C. Maritime Museum where archaeologists and conservators working on the wreck of Blackbeard's flagship, Queen Anne's Revenge, examine how to retrieve artifacts from the ocean floor and clean crusty cannon balls after nearly 300 years under the sea. View the Queen Anne's Revenge Archaeology webcast. Restoring Life to Civil War Uniforms is set at the N.C. Museum of History and shows how textile conservators preserve artifacts from the effects of time, threats of pollution and devastation of natural disasters. View the Restoring Life to Civil War Uniforms webcast. Civil War Flag Conservation is set at the N.C. Museum of History and a textile conservator leads a presentation on best practices for preserving these historical artifacts. View the Civil War Flag Conservation. For additional information please call (919) 807-7389. The webcasts are funded by a grant from the Institute of Museum and Library Services to the Connection to Collections Project of the N.C. Department of Cultural Resources. The Division of State History Museums, Division of State Historic Sites, Tryon Palace and the Office of State Archaeology are within the Department of Cultural Resources. The N.C. Department of Cultural Resources (NCDCR) is the state agency with a vision to be the leader in using the state's cultural resources to build the social, cultural, educational and economic future of North Carolina. Led by Secretary Susan W. Kluttz, NCDCR's mission is improve our state's quality of life by creating opportunities that promote economic development, stimulate learning, preserve the state's history and spark creativity to experience excellence in the arts, history and libraries in North Carolina. NCDCR was the first state organization in the nation to include all agencies for arts and culture under one umbrella. NCDCR annually serves more than 19 million people through its 27 historic sites, seven history museums, two art museums, the nation's first state-supported Symphony Orchestra, the State Library, the N.C. Arts Council and the State Archives. NCDCR champions our state's creative industry that accounts for more than 300,000 jobs and generates nearly $18.5 billion in revenues. For more information, please call (919) 807-7300 or visit ncdcr.gov.